Guys do you have a website And you want it to appear in the whole world. Traffic e from your whole world?.So whatever posts you write for it should appear in search. And it's possible when your every post indxed . Today this topic we are discussing How To Index Website In Google Faster Using Fetch Us Tool. ✓First of all, we know what the index means. .
Let me give you an example to know this. Like I write a new artcle in my site daily But he will come in search only when I I will tell about it. Then he will know that I have written this article today. After that he will show my article in his search engine. It is said to be an this, now you understand? ✓ why its importance of all blogger user . Now why do we need to tell about this Listen to it When you write something new and if he does not see anything then traffic will come by saying?.It is very important for indexing each post. If you do not, then the damage will happen to you. Now you think what you have to do ?. ✓ Does Google, bing, yandex need to tell about this ?. > I will help you to do this And I'm always with you I will never leave except for the Promise.This will require goohlg webmaster tool. And have to process a little bit. I am telling you step by step to read carefully. >Your website must be submitted in Webmaster Tools for this. After that your site will appear. It will have to click on its link will appear. >> First you visit webmaster tool. >> Now the dashboard will open. There will be a lot of options to see in this. .
> There will also be a crawl option below. 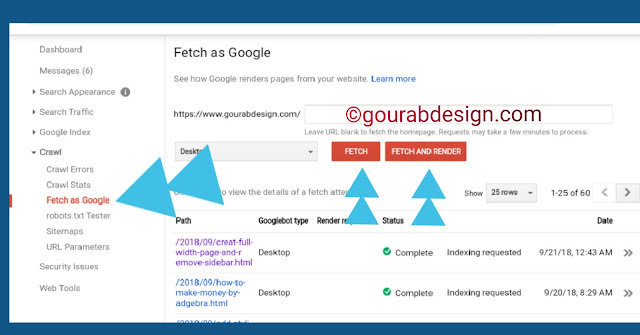 > Now see the fetch or fetch and render option. > Touch it once. Now see, new windows will open. Which has an empty box in the right side. >Now you have to put a link to your blog url inside this empty box. Any url to you can submit. But adding a link only once. Mind it. > Now you will see 2 options ( ) under this box. Which must be used well. ✓ When you do anything on any old content You mean changing photos. Write something new. Then you can use this tool.When you submit content to this tool, they will know all the changes made from this to your template.....so friends. Using both of these tools, you will be able to easily showing all of your content. I use this method too. >The biggest advantage of your link is that your post is showing everywhere on very quickly. >You can use only 500 urls from in 1 month. >If you fatching a link to the website, then only you can submit only 10 urls in 1 month. >If you submitting all your posts, then if someone copies your post after ftch you, then you will not have any problem with it. >If there is a related problem with your post, you will show a message to. >If you change the domain link, then you can the help of using this feature. That's all for today Tomorrow I will be present with some new topic. Which you will all like very much. * Write at least 3 article inside a blog on a weeke. *Do the research first, research him first. And definitely write 700 to 1000 words. *Working from the brain. One day will surely be successful. I hope you like this tip. So please share it in the Socil site. So that everyone can get help. And if you have any problem in your mind then you can ask here by commenting below. Ok now bye. Takr care to all.